What Is Under The League? Top Story: Why Does Ground Grading Always Come as a Surprise? It’s that time of year again. No, not when I write my now seemingly annual article (sorry, I’ll try and get back to it! ), but rather the time when clubs anxiously await their fate as to which division they’ll be competing in the following season. Why, though, does it always come to this? They could be seen as the Cardiff City of non-league football; they either make the play offs or fall just short of making the cut into them and now this season they are sitting top of their league, or this season you may see them as being just as good as Barcelona or Manchester United as the Daily Mail recently showed the footballing world. The town where they are based is more famous for producing carpets rather then their football. But, this season has seen the Worcestershire based club of Kidderminster Harriers making all the headlines coming out of the Midlands. Steve Burr’s boys currently sit top of the Blue Square Premier, a feat which for the fans of Kidderminster feels remarkable but it is made even more so by the fact that the Harriers were rooted to the bottom of the table at the end of August with not even a single point to their name. In fact their first win of the season came on 25th September when Kidderminster ran out 3-1 winners away at Cambridge, which saw them kick start their way up the league table. They made it to just outside the play offs on the 22nd Decemeber when they trashed play off rivals Dartford 5-1 at Aggborough. The run up the table continued into the new year, only losing three times in 2013; once on New Year’s Day when they were beaten 1-0 at home by Hereford and away to Macclesfield before their next loss came in March, when they lost 2-0 at Gateshead. The run they have had should surely makes them favourites to take the league, but the Harriers are victims of getting the games on while 2nd place Mansfield have two games in hand, which means the Stags are favourites for promotion. But surely Steve Burr’s men are in with a shout of the league title. 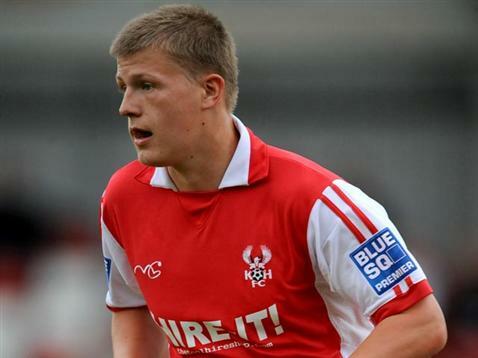 The Harriers have brought up a number of players from the lower leagues and they have starred for the Harriers – Anthony Malbon, Marvin Johnson, Ryan Rowe, Cheyeene Dunkley just some of the players who Burr has brought through into the Harriers first team after starting in Step Three. But what has really helped the Harriers was in fact the sale of star play Jammile Matt in Janaury to league two side Fleetwood Town FC for a sum of £300,000, although the Harriers faithful thought that the sale of Jamma (as he is known) will probably hinder the club’s promotion bid. In fact it helped the Harriers. The money they got for Jamma was helped to bring in on loan Greg Pearson from Grimsby and non-league predator Michael Gash who has been a star for Kidderminster as they attempt to make the step into the Football League. With three games to go can the Harriers hold their nerves? Hopefully for the long suffering Harriers faithful they can; they have seen the Harriers finish just outside the plays off in the last two seasons and the financial struggle in 2011. So It has not been all sunny skies at DY10 and I am sure they will be loving the season thus far. My only worry for the Harriers is that if they fail to win the league and are cast into the play offs, they could do a Wrexham and fail to make it through to the Wembley showpiece final. However, with Wrexham there was a tinge of disappointment having challenged Fleetwood all the way to the title then to miss out. At Aggborough yes the club will be disapointed not to go up but I am sure being in the play offs will be a bonus after the last few seasons they have had. But no one can deny that the Harriers do deserve their place in the Football League. I have watched the Harriers a couple of times; the first time was away at Stockport County in October – the game was part of Non-league day and it was hard to say that the Harriers will be challenging at the top of the table as they sadly fell to a 1-0 loss, and although they were unlucky not to take a point that day it looked like it was going to be a long season for Steve Burr’s men. Fast forward to the visit of Tamworth to Aggborough and I was working in the press box for a website called Staffs Live, and the performance of the Harriers was not the same team that took on Stockport. Although in some respect the Harriers 4-1 scoreline did flatter them the Lambs were unlucky not to come away with a point. Their finishing was clincial and you can see a massive turn around in fortune for the players. From a personal point of view it would be really great for Kiddy to go up. I don’t think there is a club with a more friendly bunch of staff or fans then those at Aggborough and it will be great for them to reach the promise land of the Football League. Hi I am Richard, I have been supporting Chorley FC and non-league football since 2004. I chose non-league because of the prices were cheaper then Premier league stuff and because I was playing in the Chorley FC soccer school. Now 9 years later I am still loving life in the world of Non-league and started writing about the world of Non-league football which has led me to doing Journalism at Staffordshire University. I have interviewed people from Dale Belford to Garry Flitcroft to Steve Kean. Also got a placement this summer at the Non-league paper. Posted on April 5, 2013, in UTL Archive and tagged Conference Premier, Kidderminster Harriers, Promotion. Bookmark the permalink. 1 Comment. Why Does Ground Grading Always Come as a Surprise? Non League Finals Day Promises To Be A Festival Of Football! Enter your email address to receive new posts direct to your inbox! BullJet Blogs IrregularMusings about football, amongst other things!